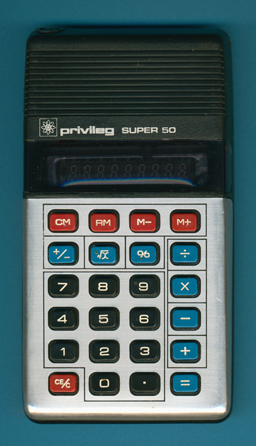 Size: 5.3" x 2.9" x 0.8"
The label Privileg was placed by Quelle, the largest warehouse in Germany selling through a catalog, on calculators manufactured by other companies. This rare model SUPER 50 was sold in the United States of America as Concept 24. © Joerg Woerner, March 5, 2011. No reprints without written permission.